I have a real problem with the episode “Dalek“. 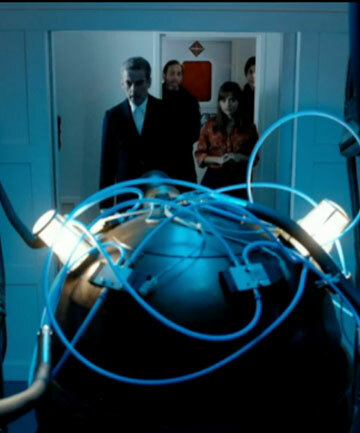 RTD made the damned thing so cool, no Dalek before or since can live up to it. Seriously. The whole sequence where the Dalek assimilates time energy to regenerate, then heads out to exterminate its captors. The solders fall back, firing meagre weaponry that fails even to penetrate the Dalek’s basic shielding. We see bullets fly, only to slow, flatten and fall to the ground. The soldiers spread out, and we discover the Dalek war machine has 360 degree rotation in the upper and mid-section. Killing energies fly – soldiers fall, skeletons momentarily visible. The Good Dalek did some of that here – and the soldiers tried all they could to stop it… but the Dalek couldn’t do anything really cool. It didn’t do anything new. It blundered along like the Jock sauntering into the party late, unaware that the really Cool Guy arrived an hour earlier in the same clothes and pulling off better tricks. As a result, “Into The Dalek” didn’t break enough new ground. Doing the “Innerspace” thing, miniaturised to complete repairs, proved interesting enough, but the Dalek failed to stun or amaze. I want to be wowed. And, I could easily be wowed with just that 360 degree swivel thing and a bit of hovering. Or, if someone could please serve me up a technicoloured iDalek (per “Victory of the Daleks”), because I didn’t have a problem with that particular makeover. They appeared in “Asylum of the Daleks“, so why not since… and why did they appear on that occasion and not have an issue with the old gold-style kind? Anyway – I found the threat of the Dalek underwhelming and the human forces uninspiring. For all the tough talk of putting The Doctor to death the moment he arrived, they appeared woefully ill-equipped in the face of a single enemy. And why did they bring it on to the ship if they didn’t have the guns to handle it? I understand the lure of a partly disabled Dalek and the potential of turning it against your opposition – but, when it bites during the operation to heal it, shouldn’t you have proper gloves and something ready to put it down, just in case? The Clara/Pink sub-plot didn’t grab me much. It seemed weakly tagged on and all too obvious where it was going with the anti-militaristic viewed of the Doctor in the aftermath of his last regeneration. A Good Man Went to War – and he didn’t like it much. I know everyone differs in taste and exposure to TV – and kids watching won’t have this issue at all (but, I’ll be continuing with this in a moment) – but guest starring Tyres (Michael Smiley, ‘Spaced‘) and Vod (Zawe Ashton, ‘Fresh Meat’) in the same episode proved a little too much for me. How can I take this war seriously? I didn’t have trouble with the accent this time, but I did suffer some severe Malcolm Tucker moments. When The Doctor first inspected and talked about the Vault inside the Dalek that inhibited certain emotions – something in his tone and delivery just shouted Malcolm at me. Anyone who never watched “The Thick of It” won’t get what I’m suffering. However, I suspect those people who straddle fandom of Who and Tucker might be having issues differentiating the performance – which ultimately must come back to Capaldi and the writing. One hopes that he still has time to settle. This entry was posted in Current Doctor, Review on September 9, 2014 by Paul B.